Customization is a crucial part of any software and with Bill4Time you can customize the system to fit your needs. Within your Settings, there are system preferences such as establishing common key words and phrases that will be used throughout the software – like your Project, Labor, Activity, and Tax mnemonic terms. You also have the ability to customize your IDs by selecting these options in your settings. With our latest release, the ability to customize your Invoice Numbers is now available. 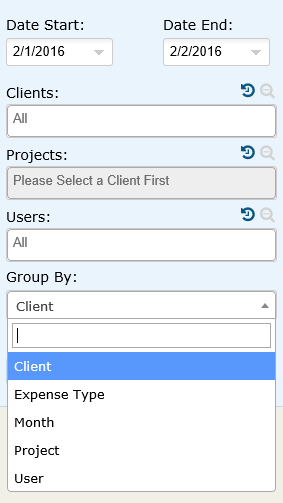 By default you will always have the option to customize your Client ID’s when adding new clients in the system. Under your Settings you can also enable the ability to customize your Project and Invoice numbers as well. Once these fields are checked in your Settings you can go through and change your Project ID’s and Invoice Numbers at any point. Once you go through Invoicing – Create Invoice to create a new invoice, the bill will be assigned a specific Invoice number. You can then change this to any number (or letter) and click Save to keep that new invoice number set on that specific invoice. With this option you can now set your own custom invoice numbers for each of your invoices. Did you know that businesses that offer online payment processing typically get paid faster? Sometimes within hours of receipt of the invoice! 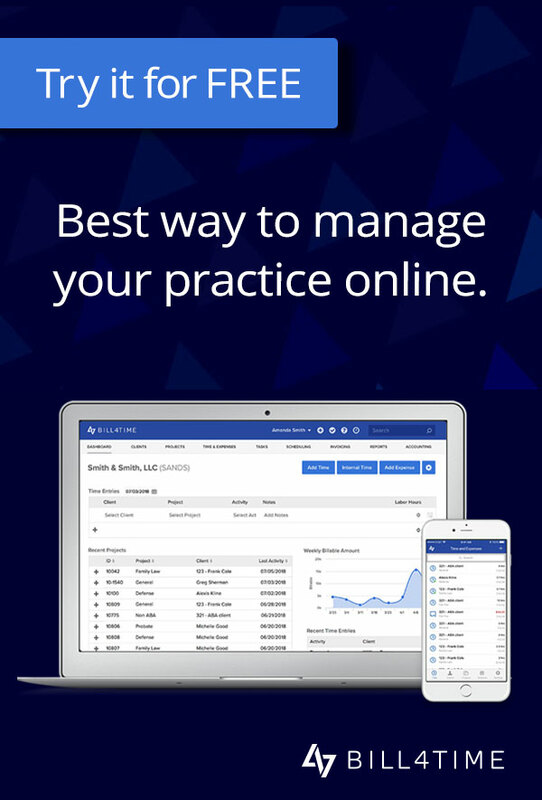 Bill4Time is excited to announce a new integration with LawPay, a leading online payment processing vendor. It’s easy to setup and takes just minutes to connect. Plus, Bill4Time makes it easy to account for every transaction as funds received through LawPay are automatically applied to your client’s ledger. To enable your LawPay account integration in Bill4Time please follow these instructions. Click on the tab labeled Client Portal, then click on the ‘Manage Portal’ button. Sign in to your portal with your Bill4Time username and password. On the right-side, under the ‘Payment Setup’ heading, select LawPay from the dropdown list. 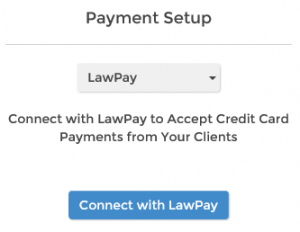 Enter your LawPay account credentials, then click the ‘Connect’ button. 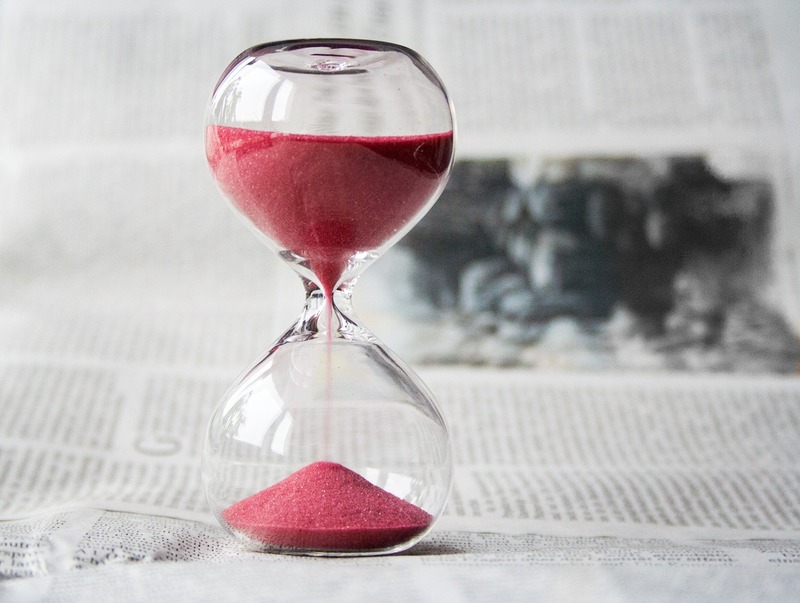 Bill4Time makes running your business easier. Just Released – Account Manager! Bill4Time has added new management features! This functionality is designed for Account Managers to manage the data entered for clients they manage. Within each user you have the ability to toggle on Account Manager functions like “View Entries”, “Edit Entries”, and “View Billable Rates” under User Permissions. 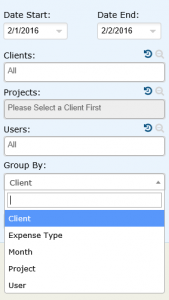 Once these functions are turned on, the Account Manager will have the ability to go under Time/Expenses, Projects , and Reports to view the time entered for all users on any client they manage. This will not affect their ability to add time for clients they have access to, but do not manage. So if a user has limited access in the system, these permissions will still stand on clients they do not manage. On Reports, each user will still be able to run reports for themselves; but now, they will also be able to run the reports for the users that enter time and expenses on clients they manage. In the example below, user “Kristin ONeill” has access to add time to client “Phyllis D’mar”, but she is not the account manager for this client. However, she is the account manger on client “Sally Moore”, so she can view and edit the entries for users Jane Smith, Kevin Moore, and herself, on this report. 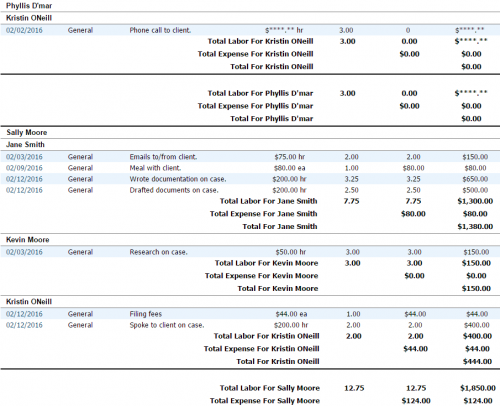 Need a quick way to track overdue fees from past due invoices? With the new Automated Interest feature in Bill4Time, it’s never been easier. You have the ability to turn on or off whether you would like interest to be calculated automatically or if you would like to continue manually applying fees to invoices. Under Invoice Setup you can check the box next to Auto-Calculate Fees along with entering your Fee Type and Grace Period. Once that is saved, the system will automatically track your interest based on your settings. These settings can also be changed per Client and Project. From the invoice, you can check to see the amount applied. You can also edit the late fee to make any changes or adjustments if you need to override the default settings. Each day an invoice is overdue it will accrue interest. Adding a late fee to your invoices gives your clients an incentive to pay their invoices on time. The automated late fee will also give you assurance that valuable time and money is not being lost. 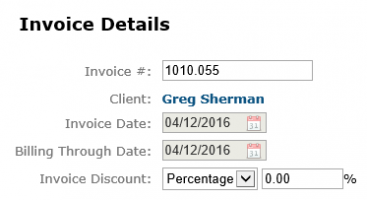 Just Released – New Invoice Discount Feature! Within Bill4Time, you are able to include a flat fee or percentage amount discount on your invoices. This feature has recently been enhanced to allow for a default discount setting within the Invoice Presets for each client and matter. Establishing a default discount setting allows you to automatically apply this discount to each invoice for a specific client or matter – eliminating the extra step remembering to add the discount amount after the invoice has been created. Once you choose your discount option, either Flat Fee or Percentage, you can also default it to only apply to Labor or Expenses. Once an invoice is created, the settings you established in your Client or Matter will automatically take effect. You can always override this on the Invoice level if you want to change the discount per invoice. Recently we upgraded our Expense reports to organize and add updates. You can group your Expense report by Client, Project, User, Expense Type, and Month. When grouping by Client it will show all expenses billed per start and end date along with the cost and sell price. Grouping by Project will subtotal your expenses per Project. Grouping by User shows all expenses in the time frame along with the Receipt Files. Expense Type allows you to organize by your customizable types. Lastly, your group by Month will total by month and subtotal by Expense Type. 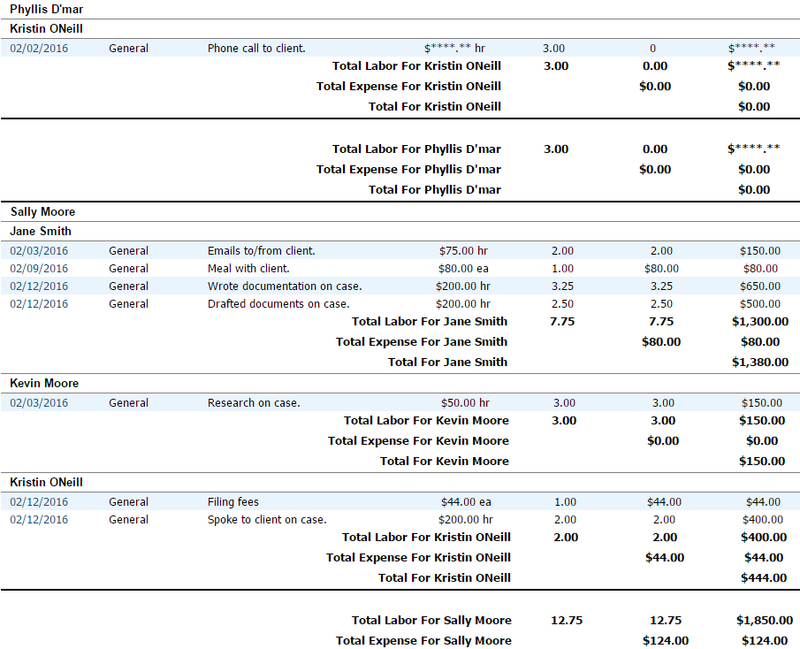 All reports have the ability to Print, save to PDF, and export to Excel for further customization.